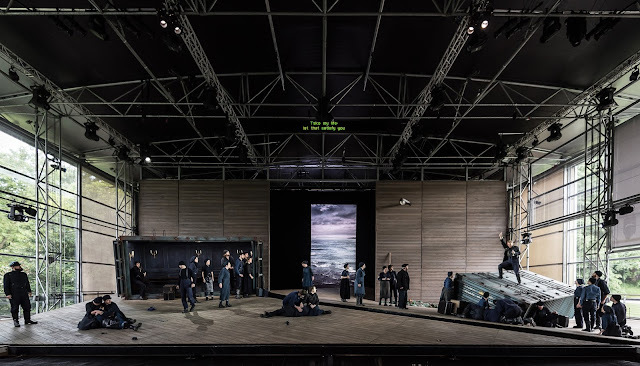 Garsington Opera is growing, this year there are four operas not three, the Philharmonia Orchestra is joining in with a five-year agreement to provide the orchestra for one of the four, and such was the enthusiasm for the season that one extra performance has been added. Outside the main season this year, there will also be a new opera, a people's opera written for the local community, Roxanna Panufnik's Silver Birch, and next year the main season will include a brand new commissioned opera from David Sawer. I met up with Nicky Creed, Garsington Opera's CEO to find out more. Last year the Garsington Opera season sold 98% of capacity, and with their expansion this year they do seem to be bucking the trend. Nicky tells me that booking this season is already at 87% which is where they want to be because they still want tickets to be available when public booking opens on 28 March 2017. But this sort of calculation is tricky as the demand is volatile; tickets for Handel's Semele 'shot out of the door' which is why the company added an extra performance, because there was a danger that their members might not be able to be able to buy tickets. Pelleas et Melisande is proving to be slower, though the opera is notorious at the box office but Nicky points out that there are indeed a great many people who love the opera. 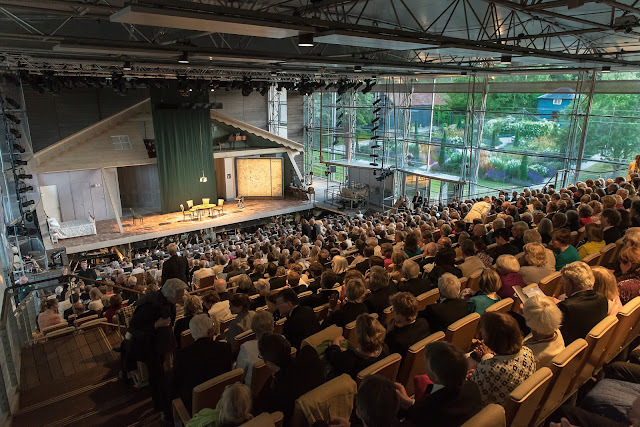 And one of the things that Garsington has come to appreciate about its members is that they are knowledgeable people who enjoy a good night out at an opera they don't see all the time. But Nicky admits that it is a challenge to get the right balance, with suitable mixture of the popular and the lesser known. And the company has to sell 96%, if they don't they have a problem, so it is quite a balancing act. For Nicky that is the excitement of it, and why she is still there after 17 years. Membership has doubled in size in the last five years, so this means that there are 1200 new members that they need to get to know, with all the changes to the members preferences which this implies. 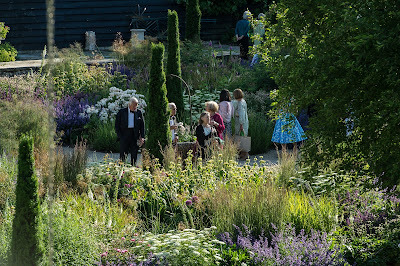 Garsington Opera moved to its present location, at Wormsley, in 2011 transferring from a setting on a terrace in the gardens at Garsington Manor to a custom built pavilion. This has entailed changes, but the company has tried to transplant the best of the old Garsington to the new. Certainly it is true that it is far easier to strive for excellence in the new theatre. The old one, picturesque though it was, provided limitations; everything, including the sets, had to come through a 1.5m wide stone arch. So something like Cinderella's caravan had to be sawn in half and hitched back together again. But Nicky points out that at La Fenice in Venice all the scenery has to come in barges, so limitations can be overcome. The new theatre has huge doors so lorries can drive right up, making bringing the sets in much easier. But without the constraints of the former theatre the new one has bigger sets, and more elaborate ones, with designers stretching the new theatre to its limits. And of course, this means that costs have doubled though the results are very welcome. The greater flexibility of the theatre means that the company has started thinking about co-productions and rentals, and talking to other opera houses and building relationship. 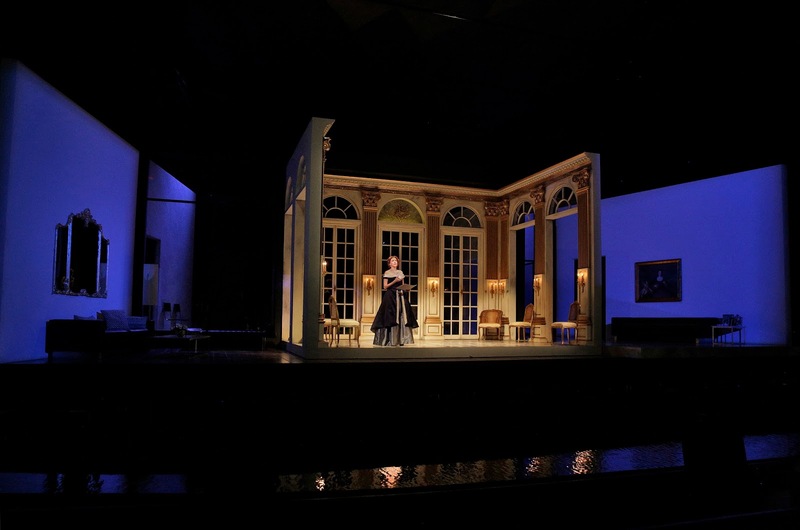 Tim Albery's 2018 new production of Richard Strauss's Capriccio (which debuted at Santa Fe Opera last year, see my review) is just one such. Nicky comments that they are excited to be welcoming Albery back, his production of Mozart's Idomeneo in 2016 (see my review) drew accolades. But she points out that co-productions don't really save money, they simply mean that you can have a better set. The company is developing quite a number of partnerships, and Nicky comments that you quickly get to know whether one will work or not. With Santa Fe Opera there is the advantage of similar shared interests and both companies rely heavily on private support. The developing relationship with the Philharmonia Orchestra came about because the orchestra approached Garsington. The plan is for the Philharmonia to play one opera each year, which means that expanding to four opera is more viable as doing all four with a single orchestra would have been rather a stretch. The season has expanded from 21 to 34 performances in six years, so combining this with rehearsals for four operas would have been a big stretch. For the Philharmonia, it has the advantage the players will enjoy a period during the summer in the UK. Companies like Garsington Opera, with no public subsidy, are very reliant on their members and on private support. Nicky feels that they are able to challenge the audience providing they respect the integrity of the music. She points out the Tim Albery's production of Idomeneo was set in the modern day and dealt with the issue of migrants without hammering the point home. Next year will come another challenge, the first new opera in the main season, commissioned from David Sawer. Of course, this is not the first opera that Garsington has commissioned. Four years ago they put on Orlando Gough's Road Rage as a community opera, part of the company's extensive outreach programme, and this year there will be Roxanna Panufnik's Silver Birch. This will have a professional cast and professional orchestra, along with local amateurs. The community involvement will be for all ages. Nicky likes the idea of a grandparents being able to go to rehearsals with grandchildren, This year they have an age range of eight to 80, and Panufnik's opera is specifically written for this in mind. Audiences for the outreach operas are mixed, with friends and relatives of the performers alongside Garsington members. The tickets are relatively inexpensive so unlike the main season, members do not have to commit so early. In fact, tickets went on sale this week. In 2018 they will be giving five performances of David Sawer's new opera during the main season. Nicky is looking forward to it and is optimistic about sales. At Glyndebourne this year sales for their new opera, Brett Dean's Hamlet, have been very healthy and Nicky feels that Garsington's audience is similar. She adds that performing the new opera as part of the main season is a really good thing to be doing, if they are challenging their audiences with rare operas then they should also be challenging them with new pieces. She is also looking to expand their audience to people who enjoy contemporary opera but have never been to Garsington before, though she admits that it is a challenge to reach them. Further improvements are planned for the theatre itself, Nicky comments that the advantage of a seasonal opera is that when things are over you can consider what needs doing for next year. A festival has a natural rhythm with a moment of reflection at the end. So in this season there will be more draught-proofing and more heating, and there will be a new surtitle machine with a wifi link to tablets for the wheelchair platforms, and with a new hearing loop. 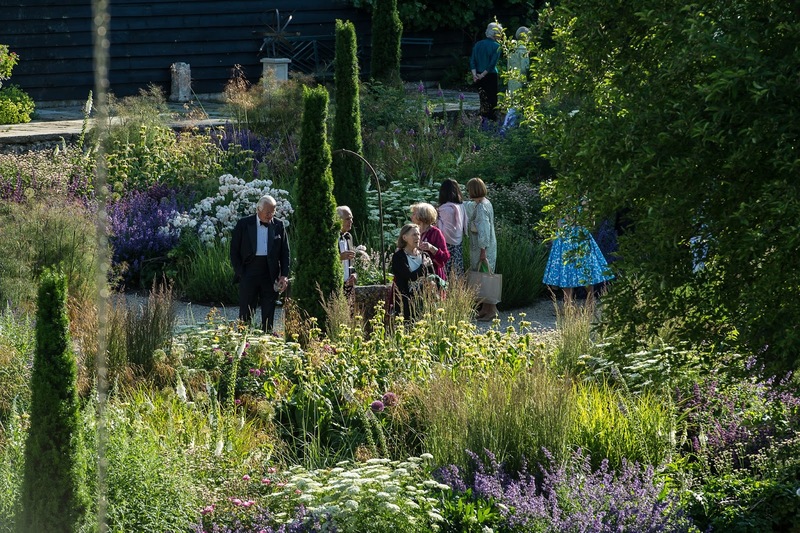 When Garsington moved to Wormsley they deliberately avoided simply building a theatre, and decided to take the tricky route of having an indoor-outdoor space in England. Their audience enjoys the light filled auditorium with the twittering of birds and being able to see the twilight. Though the audience never gets wet, the company is adding improvements to the draught-proofing with sliding screens which can be drawn back when there is a nice night. And of course directors are starting to take advantage of the uniqueness of the theatre too. 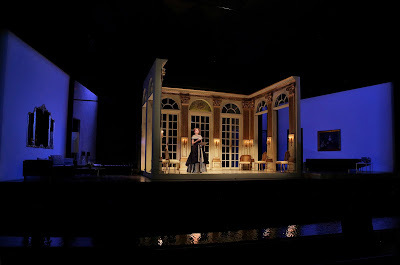 This year's production of Le nozze di Figaro was devised for the old Garsington, so Nicky comments that it will be interesting to see how the director, John Cox uses the new space. In Fidelio (2014) when the prisoners emerge from confinement, singing about the light, they go out into the light, into the garden. 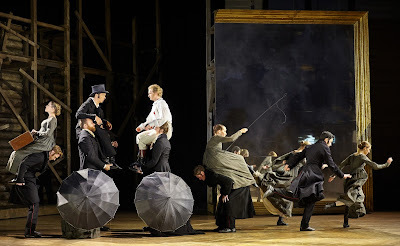 They have had cars on the stage, coming in from the back, and Papageno on a bicycle, exiting one side of the stage and emerging the other having cycled all round the terrace. As well as the members there is an under 35s scheme which is going really well. Membership costs £10 and this offers young people genuine priority booking, a half-price programme, a glass of champagne and pair of ticket for £30 each. The numbers are limited to around 150 per year and not surprisingly applications sign up in around 4 minutes flat. If under 35s have been members for three years then they have to upgrade their membership, they pay more, £40, but are able to book more tickets, and this allows more young people to join the scheme at entry level. Nicky feels that the scheme gets the young people into the rhythm of coming. The only thing holding Garsington back on expanding the scheme is costly, the young people's tickets are a real cost to the company as they could be sold at full price. But the scheme is something that they really believe in, and they are building a syndicate to support it. The other area where the company is introducing people to opera is in its outreach work. 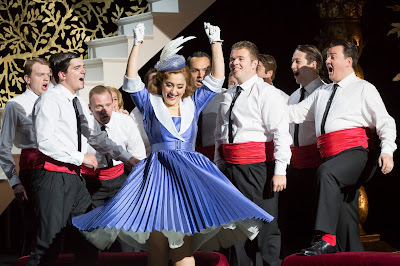 As well as the community operas there are a variety of other initiatives (see my article about Garsington's Opera for All performance in Grimsby). 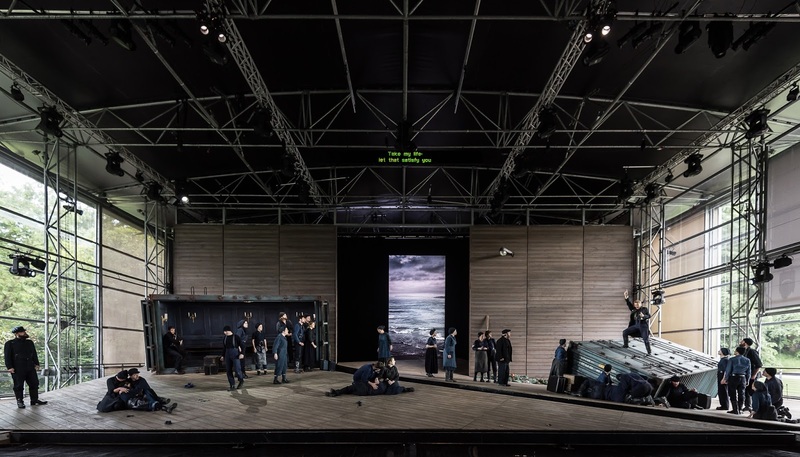 OperaFirst is a year round programme where the company works with adult community groups, primary and secondary schools to introduce them to the themes of one of the Garsington operas, last year Eugene Onegin. They then put on a full understudy show with an audience from the community groups, all first time opera audience. Again, there are significant costs but Nicky says that they have a wonderful sponsor supporting the scheme. And as well as giving the audience members their first experience of opera, it also gives the understudies a full performance of the opera with an attentive audience. The production of Roxana Panufnik's new opera Silver Birch this year is another thread in this out reach. Even the opera's title arose from school outreach sessions when children were asked what they would miss most if they went to war and one said his silver birch tree. The opera includes Foley artists from Pinewood providing realistic sounds (the opera includes such scenes as a battle), and as part of the community work a team of 90 singers, dancers, musicians and Foley artists did a three day residency at Cressex School in High Wycombe (a school where 80% of the children have English as a second language). Public booking for this season of opera at Garsington opens on 28 March 2017. The main season runs from 1 June to 15 July 2017 (Handel's Semele, Mozart's Le nozze di Figaro, Debussy's Pelleas et Melisande and Rossini's Il turco in Italia), with performances of Roxanna Panufnik's Silver Birch from 28 to 30 July 2017. Full details of the season from the Garsington Opera website. Rossini: Maometto Secondo - Sian Davies, Caitlin Hulcup, Darren Jeffrey, Paul Nilon, Garsington Opera Chorus and Orchestra, David Parry - CD available from Amazon. Richard Osborne: Garsington Opera: A Celebration - Book available from Amazon.